SigFit interfaces to the industry leaders in finite element software allowing users complete freedom to simulate mechanical disturbances in software with which they are already familiar. Finite element model data (node locations, element connectivity, and coordinate systems) are obtained from finite element model files while analysis results (displacement, temperature, and stresses) are obtained from analysis result files. The files through which SigFit obtains this data is shown in the table below for each finite element analysis software. 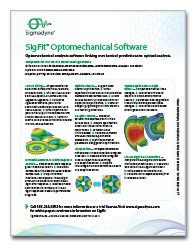 The use of SigFit involves defining references between entities defined in SigFit and the finite element analysis. For example, surfaces and lenses defined for analysis in SigFit must be associated with their corresponding nodes and elements in the finite element model. These references allow SigFit to filter and associate finite element analysis results so that analysis in SigFit may be performed. The table below illustrates how these references may be made for each finite element software. In addition, disturbance cases considered in the finite element analysis for which analysis in SigFit is desired must be referenced. The table below illustrates how these references may be made for each finite element software.